Inside our kennel complex, the dogs are divided into groups so they have a good amount of interaction and also enough privacy so they don't feel crowded. They are fully sheltered from wind, rain, and sun. Clean fluffy sawdust bedding on cement floors provides for comfort and warmth. 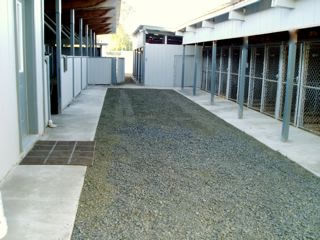 The kennel complex is secure and private with a 6' high enclosure for safety. Exercise dogs are taken once daily from their run for a leash-walk in a peaceful country setting on our property. Most dogs enjoy and all benefit from this one on one experience when the dogs are away from home. Obedience training is whatever you request: sessions begin with a play period, continue with a lesson and end with play. Tell us what you want your dog to learn! We enable all the dogs in our care to be good canine citizens. Retriever training is our specialty. For the past thirty years we have trained Labrador, Golden and Chesapeake Bay Retrievers as puppies, companions and gundogs from the most basic through National and International levels of Field Trial competition. We have both the grounds and the expertise to keep your retriever learning when being trained at our facility. Rates: Boarding: For Current rates please go to the Utopia Boarding Kennel FaceBook Page, Thank You! Reservations are made by calling us at 847-5190. Please leave a message if we don’t answer personally. We will return your call. Calls received after 5:30 p.m. will be returned the following day. Our 50 dog-run kennel facility is located at 24019 Highway 99 West, five miles north of Junction City, Oregon. We require dogs housed to be vaccinated against Bordetella (one type of kennel cough) within the past six months in addition to current annual vaccinations recommended by veterinarians. Please have current documentation with you upon check-in. Dogs are accepted and discharged between 7:30 a.m. and 8:15 a.m. or between 4:30 p.m. and 5:15 p.m. every day except for Independence Day, Thanksgiving Day, Christmas Day and New Year’s Day when we are closed. The daily charge applies for either the a.m. or p.m. pickups. Dogs are housed in chain-link concrete runs and bedded down in comfortable sawdust chips. The runs are open to fresh air yet are completely sheltered from the weather. Our kennel is a secure complex within an entirely fenced five acre site. Safety and security, cleanliness and your dog’s comfort are our priorities. We feed ProPlan dog food once or twice a day as you desire. If your dog has special needs in regards to diet or medication we are pleased to oblige as per your instructions and supply. We charge an additional fee per day for administration of prescription medication to dogs.